While our sleigh beds are our most popular style the Country Windsor Wheat Center Spindle Bed remains a popular choice of the years. This heirloom bed is made to last with 100% solid hardwood. This This hardwood bed is beautifully crafted in a country style. This Amish bed style is sure to bring a warm atmosphere in your bedroom. Our Amish bedroom furniture will be a treasured heirloom for generations. 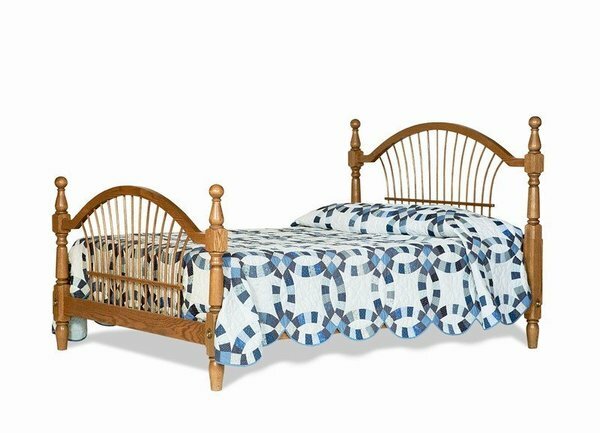 The hardwood bow back style bed takes the sheaf wheat design often found on tables and chairs to form a beautiful and one-of-a-kind bed. The headboard and footboard also replicate the look of a Windsor Chair or Bow Back Chair in the arched design. This bed is available in oak or cherry wood and handcrafted by experienced woodworkers in Lancaster, PA. Custom woods are available upon request. After an order is placed we send our finish samples to confirm your selection. We can also do custom stain matching to your existing bedroom furniture. This bed is uses mortise and tenon construction is used on the bed corners for added strength. The rails are bolted together with a through bolt and barrel nut. Each bed has five slats of which two have center supports on the queen and king beds. This product takes about 8-12 weeks to complete.